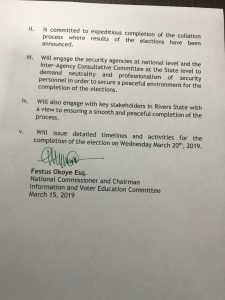 The Independent National Electoral Commission (INEC) has fixed Wednesday, March 20, 2019 for the completion of polls in six local government areas of Rivers State where elections did not hold during March 9 gubernatorial and state house of assembly elections even as it frowned at the roles played by some soldiers and armed gangs in trying to thwart the will of the people as expressed in the governorship and state assembly election in the state. 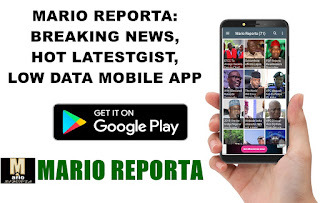 The decision followed the report of the fact-finding committee set by the Commission to probe the disruption of the collation of results in areas of the state. The Commission, in a statement on Friday night, said that collated results in 17 local government areas of Rivers state are safe in the custody of INEC while results of 21 out 32 state constituencies of the state had been declared prior to the suspension of the process by INEC. “On the 10th of March 2019, the Commission suspended all electoral processes in Rivers State having determined that there was widespread disruption of collation of results of the elections conducted on the 9th day of March 2019. Subsequently, the Commission set up a Fact-Finding Committee to assess the situation and report back within 48 hours. “INEC is committed to expeditious completion of the collation process where results of the elections have been announced. “Will engage the security agencies at the national level and the lnter-Agency Consultative Committee at the State level to demand neutrality and professionalism of security personnel in order to secure a peaceful environment for the completion of the elections. “Will issue detailed timelines and activities for the completion of the election on Wednesday, March 20th, 2019."